Former Gov. Jerry Brown (left) and Gov. Gavin Newsom answer reporters’ questions at the California State Capitol in Sacramento on November 13, 2018. Photo by Rich Pedroncelli/Associated Press. Make mistakes. Big ones. Because the state you’re about to start running needs more screw-ups. The transition now taking place in the California governor’s office feels both historic and incredibly dull—and the reason for both feelings is the same. For the first time since the 19th century, a Democrat is replacing a Democrat. Both are liberals, so what will be so different? Here’s one potential answer: the gubernatorial appetite for risk. Over the last eight years, Jerry Brown made a fetish out of his own caution. He focused relentlessly on balancing the budget, and otherwise spent and did as little as possible. When he did take the initiative, it was to undo things: paying down debt, unwinding redevelopment agencies and the school accountability system, emptying prisons, and shrinking two big projects (high-speed rail and the Delta tunnels) in order to save them. He took perverse pride in inaction; it was proof he was realistic and wouldn’t be drawn into unwinnable battles. And the state’s media, with ever fewer journalists employed to cover real news, cheerfully quoted his many aphorisms of caution. “I can’t redesign reality” was one. “If you need anything that doesn’t cost me too much, let me know,” was another. This approach brought political success—things were quiet, and the economy was good. 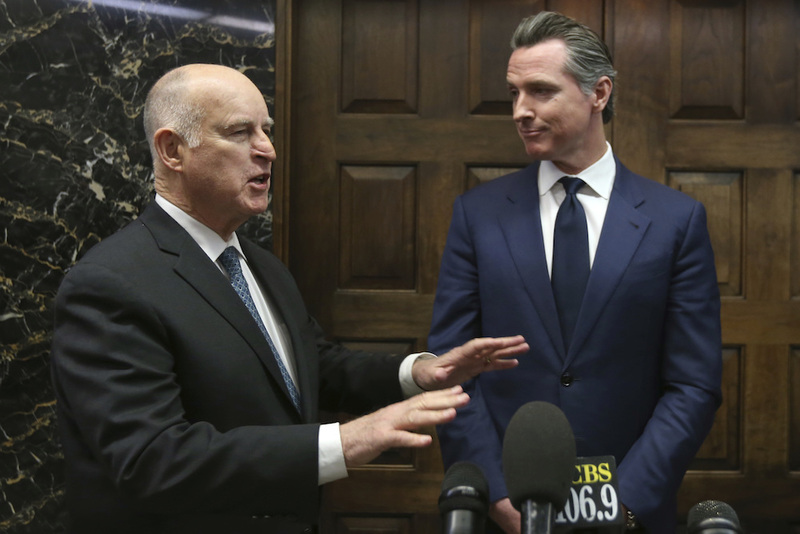 But Brown’s small-bore policymaking left many of California’s biggest problems to fester. The state’s housing shortage grew into a crisis. Poverty, particularly among children, became more entrenched. The state’s basic systems—from road infrastructure to courts—grew more clogged. Rapidly-rising costs for pensions and other retirement benefits ate up the new tax revenues that should have gone to schools. In effect, the celebrated Brown avoided the state’s biggest, toughest challenges in the name of avoiding screw-ups, creating a quandary for his successor. Gavin, can you screw up the courage to tackle them? We don’t yet know the answer to that question. Newsom ran on the slogan, “Courage for a Change.” He talked about audacious goals like health care for all, a “Marshall Plan” to build housing, a transformation of higher education, and ending child poverty. But lately, he’s made Brown-style noises about not wanting to do much, so he, too, can avoid mistakes. He seems to have backed off universal preschool, saying that too fast a ramp-up would hurt quality. He has suggested Democratic visions of new programs and taxes must be scaled back. Some of Newsom’s supporters privately argue that with California in a Cold War with President Trump, the new governor can’t afford to take risks and make big mistakes that can be seized upon by the state’s enemies in Washington. That may be good, safe political advice. But Californians need much more than just protection from Trump. The state can’t make giant progress if its leaders are afraid of giant screw-ups. The outgoing governor’s instinct for inaction has created an enormous pent-up hunger for state government to help Californians tackle the ugly nightmares that keep them from realizing new California dreams. Newsom, if he pursues his campaign agenda forcefully, is certain to be dogged by failure. Creating a new system of educational and health supports for early childhood will involve changes to existing programs that may screw up some people’s lives, and it will create a host of potentially-failure-inducing challenges—including funding for such programs, and the training of their staffs. And every step of creating a health care system that guarantees not just coverage but higher-quality care for everyone is likely to produce giant mistakes, given the array of budget, tax, business, and health care policies involved in such a transformation. Newsom’s determination to produce 3.5 million homes to ease the housing crisis will require tricky shifts in state and local laws, financing, land use, environment, and transportation that are all but certain to create screw-ups. And his stated desire to change the Byzantine tax system in California can’t help but have nasty unintended consequences that will require follow-up and clean-up. After the quiet Brown years, every noisy screw-up will draw negative media coverage for Newsom, who, with his slick style and actress wife, is an easy person to disparage. Indeed, the best way to judge this governor might be by his press coverage. If he’s being pilloried in the papers for controversies and mistakes, that will mean he’s doing well, and taking on big stuff. If things are quiet, he’s probably pulling a Brown and avoiding the hardest problems. The good news is that Newsom will have many allies. While the media narrative of California’s comeback revolves around the 80-year-old governor, the real story of this decade is of individual Californians and communities pulling themselves out of the muck of the Great Recession, without much help from their budget-conscious state. And many of the more high-profile legislative changes in California this decade—like the $15-per-hour minimum wage, the gas tax hike for roads, or sanctuary protections for immigrants—were not led by Brown. Instead, as USC sociologist Manuel Pastor shows in his recent book State of Resistance, sophisticated social movements among immigrants, labor unions, and businesses forced the cautious and reluctant Brown to sign on. The outgoing governor’s instinct for inaction has created an enormous pent-up hunger for state government to help Californians tackle the ugly nightmares that keep them from realizing new California dreams. A cautious governor would seek to temper that hunger. But California needs a leader who will feed that hunger with real plans, and then engage people in the messy business of enacting them. Dare to be great, Gavin. Be our queen of screw-ups.